The employment relationship is governed by a large number of formal Acts of legislation. One of those less talked about and often forgotten by Employers is the Protected Disclosures Act. In essence this Act provides for protection for employees or workers who disclose information about wrongdoing (contravention of laws, health and safety or unfair employment practices) in the workplace. The Act sets out the obligations for Employers with respect to following up on any disclosures and the time period in which these procedures should be followed. The Act also provides for immunity of prosecution for employees or workers for the disclosure itself, but not if they themselves have been party to any illegal acts. From a practical perspective, employers should be aware of the Act and its implications and we would encourage employers to have an appropriate policy to deal with such matters and use publicly available technology/processes to manage any disclosures so that they do not create further risk for themselves. Should you wish to discuss possible solutions please feel free to contact us by email at [email protected]. The objective of this article is to make employers aware of the Act and its consequences, but it is not intended to be a summary of all provisions of the Act. In the 2017 amendments, worker was expanded to include Temporary Employment Services workers creating an obligation for employers to also protect these individuals in specific circumstances. The amendments specifically allow for the TES worker to bring a claim against either their employer or the client. The Act provides for the payment of compensation and/or damages and/or reinstatement for any impacted employees or workers. The Act further provides that any dismissal in the circumstances is deemed to be an unfair dismissal and any other occupational detriment is deemed to be an unfair labour practice. At HRTorQue we specialise in providing payroll and HR administrative services. There is a close relationship between the processes in finance and those in payroll (often payroll is run by the finance department) including the need to accurately reconcile payroll and capture payroll information into the accounts (while retaining confidentiality). We are therefore pleased to announce that we have added finance resources to our capabilities and are now able to offer a number of services to clients including those below. Please be advised that the South African Federation of Trade Unions (SAFTU) has given notice of its intention to initiate a one day national protest action on 25 April 2018. The protest action is aimed at highlighting the Federation’s concerns surrounding the minimum wage, economic policy and free education. Employees who wish to participate in this protest action are entitled to do so and no disciplinary action for absenteeism may be instituted against such employees. The ‘no work, no pay’ rule will however be applicable. Employers who have queries in this regard may contact the NCBC HOTLINE on 086 016 3272. The best companies have the right system to manage their process. This doesn’t have to be the best in the market. It must however create the right platform to store information in a way that is easy to update and easy to extract (report). Considerable energy can be wasted when the system is not fit for purpose. The nice thing is that these days companies of all sizes can get access to systems – it is no longer the case these are only available to the large companies. “If there are no ground rules, you can’t play the game.” Often a lack of policies and procedures leads to confusion, incorrect processing and the wrong outcomes. It goes without saying that getting the right people for the job is critical. Good managers will know this and will be prepared to have the difficult conversations and go through the pain to make sure they get the right people. If you can tick all three boxes then it is likely you will be successful. The Official Interest Rate for calculating Fringe Benefits decreased by 0.25 % effective 1st August 2017. Where an employer gives an employee a loan that is less than the official interest rate or interest free, the difference between the two must be taxed as a taxable Fringe Benefit. This Fringe Benefit should be processed via the payroll and reported on the Employees IRP5 against SARS Code 3801. The Official Interest Rate is defined in the Seventh Schedule as the rate of interest that is equal to the Repo Rate, plus 100 basis points (1%). The repo rate was decreased from 7% to 6.75% on the 21st of July 2017, which means the deemed interest rate dropped from 8% to 7.75% effective 1st August 2017. The Rand has resembled a punching bag over the past year or two and its woes are never far from news headlines, but what does this actually mean for you and me individually? 2015 was one way traffic as the Rand gave up 30% against the Dollar with almost no respite over the 12 month period, but 2016 has been a very different story. Yes, there has been weakness this year (and the very real threat of even more!! ), but there have also been pockets of Rand strength. So, given the volatile nature of the Rand this year how does this impact us in everyday life? Some of the impacts are obvious, but others are hidden yet no less important. The most obvious impact is for those businesses who participate in the import or export sectors. If your business imports raw materials, capital equipment or finished goods then staying closely in tune with the Rand’s fluctuations is of paramount importance. As an example I had a client who calculated his costs at €17.20 before quoting his local client, and this off a sizable import invoice of €110 000 to pay a few months down the line. Local political headlines quickly drove the rate to €17.80, and I can promise you that my client was in a mild state of panic. My advice is if you have a big invoice payment to make, or a fixed cost to adhere to then fixing your rate forward is essential. For those individuals looking to externalise a portion of their wealth then knowing what factors impact the exchange rate is key. If possible, it is advisable to have approximately 30% of your investible wealth in a hard currency (USD, GBP, EUR, CHF, JPY) but if you are about to send monies offshore for the first time then it obviously doesn’t make sense to do so when the rate is high. While predicting what the rate will do is an impossible task there are markers in the economic calendar that impact the Rand. FED monetary policy announcements, our SARB monetary policy announcements, US employment figures (first Friday of every month) and various others will drive Rand action so be mindful of these before going offshore. For those individuals who have already taken money offshore and who are looking to send more then the exchange rate becomes very important. It is vital that you calculate what your average exchange rate is over your previous transactions so that you know when to send additional monies at a rate that will bring your average rate down. Quite simply, add up the Rand value of all your transfers and then add up the Dollar values you received offshore (assuming you bought Dollars). Divide the Rands by the Dollars and that will give your average exchange rate, and then make sure any further transfers are below this rate. Our inflation rate is directly linked to the exchange rate. Almost everything we buy, from food, to clothes to electrical equipment to petrol has some import component in its price. If the importer has to spend more Rands to bring these goods in, then this additional cost is passed on to the consumer. Unfortunately, we all know that the opposite is seldom true, and that prices do not come down as the exchange rate improves, but keeping an eye on the exchange rate will help you budget for your monthly expenses should the currency be in a weakening trend. Our interest rate is also linked to the exchange rate. This is an indirect relationship with inflation as the common ground, and the Reserve Bank has set a target of 3% to 6% inflation. At present we are above 6%, with some economists predicting a breach of 7% by year end. To curb inflation the Reserve Bank increases our interest rate which attracts foreign investment and strengthens the Rand. Almost all of us have some form of debt, and a rising exchange rate that drives inflation up will ultimately end up in higher interest rates and bigger monthly instalments. The Rand was stuck in one way traffic during 2015 as we lost approximately 30% of our value against the US Dollar. But, so far, 2016 has been more of a rollercoaster ride with pockets of Rand strength being countered by various setbacks, either through our own local doing (threats of arrest for Pravin Gordhan) or through international factors (plunging oil price, fears over China’s economic health, the list goes on). Whether you are directly involved in an import or export business, or simply wanting to stay abreast of inflationary pressures as a result of Rand fluctuations, it is worth taking a look into the back half of 2016 and what lies in store for our beleaguered currency. I must however stress that this is not a prediction of what will happen to that Rand, but merely an assessment of events that could have a certain impact should they transpire. Brexit is actually a risk and an opportunity given that the actual impacts of this unprecedented event will not be fully understood until it has run its course. As an opportunity Brexit has created huge uncertainty in the market, and the knee jerk reaction is for investors to run to “safe havens”, which include gold and gold shares. On Friday the 24th of June (the day after the UK referendum) R4.2bn of foreign capital flowed into SA in search of our bonds and gold shares, and over R22bn flowed in over the following week. This is the biggest weekly inflow since 2008 and demand for Rand based assets saw us surge from a low of R15.67 early on Friday morning to R14.84 by mid morning. Brexit is far from over, and as the UK and Europe muddle their way through some form of resolution we can expect the resultant inflow of investment capital as a result of uncertainty to boost the Rand. The Rand dances to the tune of interest rates in the US, with any increase in Dollar interest rates attracting investment capital away from Rand based assets and therefore weakening the Rand. A combination of mixed economic data coming out of the States plus global uncertainty following hurricane Brexit has meant that the FED has effectively removed any further interest hikes in 2016 from the table, and in fact there is a small chance of a rate decrease. The FED meets in mid July, September and December and should US interest rates remain unchanged, coupled with soft statements on future hikes then the Rand should strengthen at those points. Local inflation is already breaching the upper limit of 6% as set out by the SA Reserve Bank, with forecasts calling for 7.5% by year end. While unlikely given the Rand’s recent recovery, our Monetary Policy Committee has the ability to increase local interest rates by 25 basis points which will make Rand based assets more attractive to international investors, and the resultant capital inflows would drive the exchange rate down. As mentioned, this is an unlikely scenario which would probably only take place if the Rand crept up to the mid R16/$1 mark therefore threatening to escalate inflationary pressures. The final Rand “opportunity” is a bit of a long shot but worth mentioning none-the-less. In early June, Bloomberg switched their outlook on the commodities market from a bear to a bull run, this off the back of their commodity tracking index surging by 20% since January 2016. With stockpiles being depleted and supply constraints coming into play Bloomberg feels that a 4 year bear run could be behind us and commodity prices are set to increase. With Commodities making up 60% of our exports this would only be good for the Rand. As mentioned Brexit is both a risk and an opportunity, and the risk portion is also market uncertainty. While investors move to safe havens in times of uncertainty they also exit riskier assets. So while our gold shares benefit the rest of the JSE gets sold off and these capital outflows cause the Rand to weaken. While this point might seem contradictory to the first “opportunities” point above I can guarantee you that the Rand would have faired much worse post Brexit if we had no gold shares on our local exchange. The 3rd of August sees our local municipal elections and if the violent scenes in Durban and Tshwane are repeated across the country, or if rigging is evident, then the international investment community will lose faith in South Africa causing the Rand to weaken. October sees Pravin Gordhan deliver the mini-budget with credit ratings agencies paying close attention to our GDP performance as well as concrete evidence of structural reforms pulling through from the main budget tabled in February this year. We have already seen GDP come under pressure since Feb, and any unrealised reform promises will weigh heavily on the Rand. On the 8th of November we have the US presidential elections and the race between Donald Trump and Hilary Clinton is too close to call. Depending on who you talk to both candidates will either be a massive success or failure so potential impacts on Rand are difficult to predict, but uncertainty is usually associated with Rand weakness. December sees the next round of credit rating agency reviews with an overwhelming consensus amongst economists that a downgrade to junk status by at least one of the agencies is a certainty. Pravin Gordhan pulled a rabbit out the hat by avoiding a downgrade in June, whether he can do the double in December remains to be seen. So what does all this mean? In Foundation Fund Manager’s opinion, the risks to the Rand outweigh the opportunities, particularly in the longer term as a downgrade to junk status would take years to recover from. Given that there will be pockets of Rand strength over the next 6 months we advise that any importers use these to book forward contracts, and any investors use these to build their positions in hard currencies. In the pressurised and action orientated world of small and medium sized business, a coach might well be the ultimate secret weapon in maximising your potential. While the corporate world has long used coaches to support and develop executives, smaller businesses that face similar challenges have rarely had access to this type of support. Without all the resources of big business, entrepreneurs in medium and small businesses often feel isolated and short of support as they deal with day to day issues. They also often face additional pressure as they play multiple roles, which might include managing staff, planning strategy, monitoring production, customer service and finding new markets, the list is endless. In this pressured environment, trying to find time for full day training workshops and seminars means that personal development goes way down the wish list and becomes a “nice to have” rather than an integrated part of business operations. This is where coaching can provide an efficient and effective solution for achieving personal and professional excellence. So what is coaching? Essentially coaching is a focused and co-operative partnership with someone whose only agenda is your agenda. A coach works with you to identify where you are now, defines where you want to be and then supports you in getting there in the most effective way. Sessions are scheduled every three to four weeks and run for approximately an hour, with additional support provided via telephone, or even Skype. A coach can act as a sounding board in thinking through important decisions, can help with accountability around action plans and build momentum by helping you take responsibility for results and outcomes. An investment in business coaching pays for itself, increasing the bottom line, getting more done by working smarter, helping you work with renewed passion and finding ways to reclaim your life by improving your work-life balance. Am I willing to stop self-defeating behaviours? Am I ready to accept responsibility for my success and happiness in life? If you answered yes to these questions then business coaching is for you. Many of our clients come to see for assistance when they are buying a new business. What they don’t realise is that there are two ways to do it. Either as a going concern (asset purchase) or by buying the shares / members’ interest of the person or people that own and operate the business. This decision alone can make a difference to the level of risk and chances of success. Buying as a going concern often permits you to zero-rate the VAT on the sale. The sale must be advertised prior to the effective date to avoid creditors attacking the disposition by the sellers and trying to set it aside as void. This is something you should be checking during your due diligence regarding outstanding creditors’ claims. If the business is in manufacturing/plant or heavily reliant on equipment, you must inspect and audit all machinery and itemise each and every component that forms part of the sale and provide for an inspection prior to taking transfer. You need to also be sure the equipment is not outdated, faulty or unnecessary. The value of the equipment is part of the purchase price and you need to ensure that on transfer of the business you have working machinery to continue production. If you are worried about the business under new management, consider agreeing a projection from the seller based on historic progress and realistic figures to form part of the agreement and if possible, stagger payment of the purchase price to accommodate any adjustments if the seller’s representation was way off the mark and you over paid. This will have to be drafted to ensure that it takes market and unforeseen circumstances into account. A business may be successful and profitable because of the relationships that the seller/s have built up over time. The seller is receiving value from you in terms of the purchase price for you to acquire that profitability. It is imperative that you protect your acquisition by ensuring that the seller/s does not start up in competition with you and use their relationships and success to unfairly compete with you. You must put adequate and enforceable restraints of trade and confidentiality undertakings in place to protect your investment and the goodwill of the business that you are purchasing. 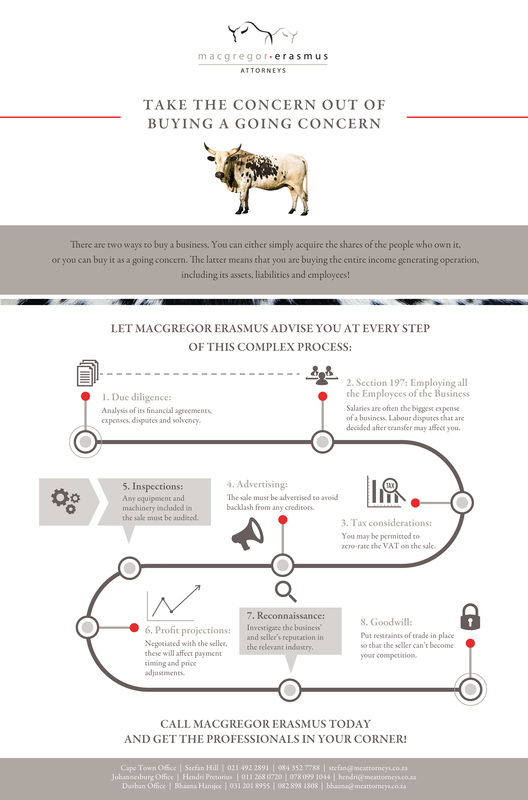 Please download our infographic: “Buying a Going Concern“.